Despite passing away in 1952 at only 33 years of age, Eva Perón, aka Evita, is still among us. While her legacy is strongly felt in her native Argentina, her lasting presence has defied both national borders and the corrosive effect of time. Aside from permeating Argentine politics and society to this day, she has been the subject of books, films, musicals and plays that have transcended the national arena. Tim Rice’s and Andrew Lloyd Webber’s highly acclaimed musical Evita has been captivating audiences across the globe since the 1970s. Alan Parker’s eponymous musical film from 1996 was released in 36 countries. Argentine-French playwright Copi’s combined provocative theatre play Eva Perón/El homosexual o la dificultad de expresarse has been running in theatres inside and outside of Argentina since 2017. Academia too has tracked Evita. Marysa Navarro’s 1994 Evita and Alicia Dujovne Ortiz’s 2008 Eva Perón are among the most renowned biographical works on Evita. Recent studies include César Maranghello’s 2016 Eva Duarte, más allá de tanta pena and Jill Hedges’s 2017 Evita: The Life of Eva Perón. All of these constitute snapshots of the myriad cultural manifestations that have contributed towards keeping Evita alive in the social imaginary. But to understand the perpetuation of her image, we need to know who Evita was and how she became an iconic figure. Evita was born in the impoverished rural town of Los Toldos a century ago on 7 May 1919. At the age of 15, she travelled to Buenos Aires where she became a radio actress. In January 1944, while attending a fundraising concert, she met the then Labour Minister Colonel Juan Domingo Perón. In October the following year, the couple tied the knot. 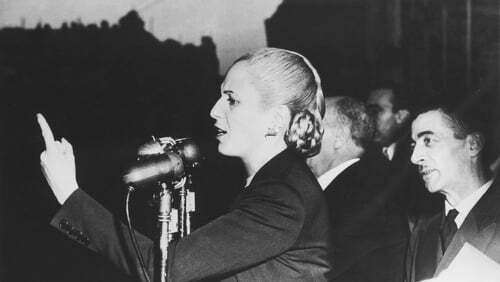 Once Perón was elected president in 1946, Evita gave up her acting career as she was tethered to Perón’s political activities. Her metamorphosis from actress to president’s wife had a significant impact on her future iconic image. As the first lady of Argentina, Evita aroused mixed feelings. She was despised as a social climber by the Argentine bourgeoisie, but her dedication to fighting poverty promoted her saint-like image among the disadvantaged classes in Argentina. If she was considered a saint by her supporters, her image evolved into martyrdom upon her death. This was due to her passing away from cancer and, even more so, the puzzling disappearance of her body. Evita’s intriguing story did not end with her demise -- quite the contrary. After Perón was toppled in 1955, the military regime that seized power launched an anti-Peronist campaign that included the confiscation of Evita’s embalmed body. In their intent to completely eradicate Peronism from Argentina, the military secretly sent her body to Italy where she was buried under the false name of María Maggi de Magistris in 1957. This move, however, backfired on the military. The 1960s and 1970s saw the emergence of guerrilla groups who fought against the military governments in power. Being strong supporters of Peronism, these groups became the Peronist resistance and re-iconised the image of Evita so that she came to represent their hatred, anger and unity against the military repression. One of these groups, the Montoneros, kidnapped and killed former Argentine President General Pedro Aramburu (1955-1958) who allegedly knew where Evita was buried. In exchange for Aramburu’s corpse, the Montoneros requested Evita’s body. To appease the guerrilla insurgency, her body was returned to Argentina in 1974 and she was buried in the Buenos Aires Recoleta Cemetery two years later. In recent times, Evita has regained political influence once again. Argentine President Cristina Fernández de Kirchner did not miss out any opportunity to extol Evita as the paradigm of the ideal Peronist. Her presidency coincided with both the 60th anniversary of Evita’s death and Argentina’s Bicentennial of 1810 and Fernández de Kirchner promoted the Evita effect. These two celebrations prompted a series of actions that revamped Evita’s image. She was named the Woman of the Bicentennial and her portrait was featured on the 100-pesos bank note. Two feature films were made, María Soane’s Eva de la Argentina and Paula de Luque’s Juan y Eva. Argentine artist Daniel Santoro was commissioned to create two spectacular murals of Evita which hang from the Ministry of Public Works building on the Avenida Nueve de Julio in Buenos Aires. Saint, social climber, disappeared, martyr, revolutionary, ideal Peronist: Evita has embodied them all. Scholar Jean Graham-Jones has said that "icons are subjected to periodical or cyclical resuscitation and re-iconisation". It is precisely the re-iconisation of her image that keeps Evita among us. The myriad images of Evita never seem to stop surfacing. Having been shaped by more than 65 years of history, Evita’s protean image will undoubtedly continue to thrive, multiply and thus influence politics, artists and scholars for many years to come.